July 12, 2003 - Defending five-time champions Brazil and Asian winners India set up a final showdown in the eighth World Boys' Under-19 Volleyball Championship on Saturday after brushing off their respective rivals Czech Republic and Iran in the semifinals to advance to Sunday's final. "We made it in the Asian Championship and now we proved our talent," said Indian head coach G.E. Sridharan. "We suffered on receiving in the second set, but it did not pose any problem to my team. We came back fast to win the following two sets. We have to fight all-out again against Brazil. This is the crucial moment. We can't miss it. Our goal now is only the world title," he said. more Pic: India get ready for Sunday's final. Pic: Brazilian coaching staff work furiously on the game plan against India. Pic: Thailand’s 21st Prime Minister Banharn Silapa-Archa at the Opening Ceremony at Silapa-Archa Gymnasium. 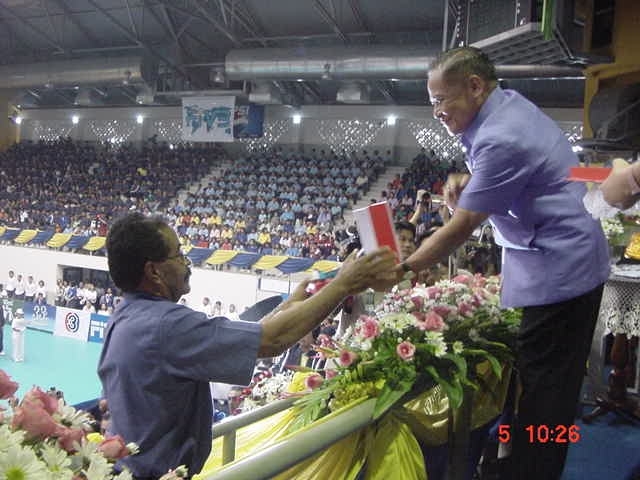 July 4, 2003 - Suphan Buri, Thailand – Head coaches of teams competing at the World Boys’ Under-19 Volleyball Championship took the opportunity on Friday to exchange views on the tournament, which starts on Saturday at the 4,500-capacity Silapa-Archa (4,500 seats) and Chaopha (2,500 seat) Gymnasiums. All coaches except those from Russia and Puerto Rico attended the press conference. Apichart Kongsawat, Head Coach, Thailand: “Yesterday, we played a friendly match with Italy. We had a 1-1 win-loss ratio. Against Puerto Rico in the curtain-raiser, I admit that we have yet to see their form. However, judging from their physiques and ours, I think there is no difference. The difference will only be in tactics and style. Anything can happen, I think. We need only a win in the round-robin preliminaries to make sure we will advance to the second round. However, I think my team has enough ability to enter the last eight teams. I hope my boys will do their best.” Thailand are hosts and are making their first appearance at the world championships. Naser Shahnazi, Iran’s Head Coach: “No one knows what will happen… Our team just head for winning match by match and if we happen to make it to the second round, we will then think about what we should do to go farther than that.” Iran was 2nd in 2001 and 2nd at the Asian Championship. G.E. Sridharan, India’s Head Coach: “We are Asian champions. However, competing in Asia and in the World Championship is totally different. At that time, we played on home soil and won the Asian title. Now, we are playing in Thailand. It’s an uphill task. However, I do hope that my boys will give their best in every match.” India is Asia champion, debutant in world meet. Cairo, Egypt, July 1, 2003 - The national teams from Egypt and Morocco leave Tuesday for Thailand to participate in the 8th Boys’ U-19 World Championship. They have been preparing together at a training camp in Cairo where they contested four friendly matches. Egypt won three matches, all with 3-1, while Morocco won the remaining match, also 3-1. Story by Tarek AL-ADWAR, CAVB Press Officer.